Most people don’t expect much of the person delivering the weather report— timeliness, a peek beyond the obvious, and of course, a fairly accurate prediction of what’s soon to come. 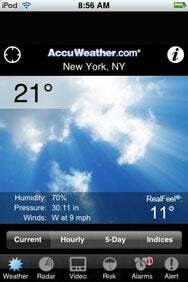 AccuWeather.com, the iPhone and iPod touch offering from the granddaddy of weather forecasters, is timely and appears as accurate as the other top weather apps for Apple’s mobile devices. It also sports a clean, intuitive interface and an elegant design that’s easy on the eyes. Clear Skies For Now: AccuWeather’s home screen is pleasant to look at, and provides basic current information—but not a hint of what's to come. But AccuWeather.com does have one major flaw: in many aspects, it lacks depth. AccuWeather provides just enough information on the home screen to let you know it’s a weather app: current temperature, humidity, barometric pressure, wind speed and direction, and “RealFeel”. The background image does change with time of day and conditions: light with clouds (or blue skies, or umbrellas) during the daytime, dark at night. This is cotton eye candy—it looks great the first few times around, but soon it wears thin, and you’re wondering why the screen space isn’t given over to, say, a brief forecast, or perhaps even a larger font for the current conditions. I typically check the hourly forecast after opening a weather app, and in this AccuWeather.com also falls short. I look to the hour-by-hour forecast to give me a pretty good idea of what it’s going to be like for the rest of the day, evening, or night. Unfortunately, AccuWeather has decided that providing information on only the next four hours is enough. If you check out the hourly forecast at 8 a.m., you’ll get the predictions until noon. If you check out the hourly forecast before bedtime you’ll know what it’s like when you’re in a deep 3 a.m. slumber, but not what the conditions will be when you walk the dog at 6 tomorrow morning. The application includes the same details for each hour as it does on the current conditions home screen, along with a graphic indicating a prediction of sun, clouds, rain, snow, and so forth. AccuWeather.com’s five-day forecast proves to be adequate, letting you switch between day and night forecasts by clicking on either the sun or moon icon. Throughout the application, the text forecasts, despite small fonts, are very readable. Typically the font color is white on a black background, which is far superior to The Weather Channel’s ( ) white-on-light-blue format. Depending on where you look, AccuWeather’s radar in motion is also iffy, at best. This feature works fine for some major metropolitan areas, but not so well for others. For instance, radar images covering London and New Delhi are so blotchy as to be useless. For major North American cities like New York and Miami, radar seemed fine. You can zoom in and out of radar in motion using the familiar finger motions, but the zooming capability is limited to a geographic area of a few hundred miles. If you’re looking for weather patterns further downstream, look elsewhere. Night and Day: AccuWeather’s five-day forecast provides information for both daytime and night; switch between the two by clicking on the sun and moon icons. Other features provided by AccuWeather include bar charts indicating “severe weather potential” for next eight hours (such as thunderstorms, rain, snow, ice, wind, and fog); “risk” charts that let you know if it’s a bad time for arthritis sufferers in the area, or if there’s a flu epidemic; and severe weather alerts. Video choices for a given area can include local, regional, national, and “breaking” weather news (which is often similar to the national forecast). Some videos are outdated: when I checked my regional video on a Monday morning, the meteorologist began with his forecast for the previous weekend. However, the regional forecasts cover plenty of cities, which pretty much ensures that even if you live away from the largest metropolitan areas, it will provide some relevant information. And the local forecast for my area, central North Carolina, focused on Raleigh, as it should. Overall, this is a stronger offering than the App from The Weather Channel, AccuWeather’s main big-brand competitor. Information is easier to read, local and regional video forecasts are more detailed and cover more cities, and a greater portion of the world is covered—much of Asia appeared to be uncharted territory for The Weather Channel, but AccuWeather’s video forecast for Asia even included remote outposts like Katmandu and Lhasa. Despite my slight preference for this app over The Weather Channel, I’m sticking with a standalone version of the Weather Underground’s mobile Web site. It’s packed with detail, easy to read, and provides radar in motion that works without a hitch. 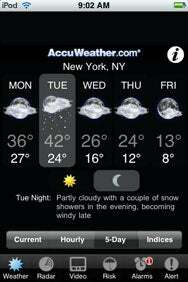 AccuWeather.com is compatible with any iPhone or iPod touch running the iPhone 2.x software update.